Footnote New Zealand Dance’s final local season for 2018, Balancing Point, is a programme of stark contrast. Elliptical Fictions by Zahra Killeen-Chance and A snail watches dust particles in sunlight [sic] by James O’Hara and Eliza Sanders are programmed in the only possible way for these two works; the first low energy, slow, ordered and the second bright, wild and free. The five Footnote dancers create cohesion and balance as an ensemble more successfully than any previous company line-up in recent times. Opening work Elliptical Fictions, billed as “an exploration of the curve evolving out of the line, and the line evolving out of the curve”, emerges from and recedes into darkness. The controlled walking graduates into circling through plié, which graduates into upper-body isolations, which then locomotes into directional changes and encompasses the space. Monochromatic visual art by Richard Killeen projected onto the cyclorama cleverly expands so gradually that it takes time to register that it’s actually moving. 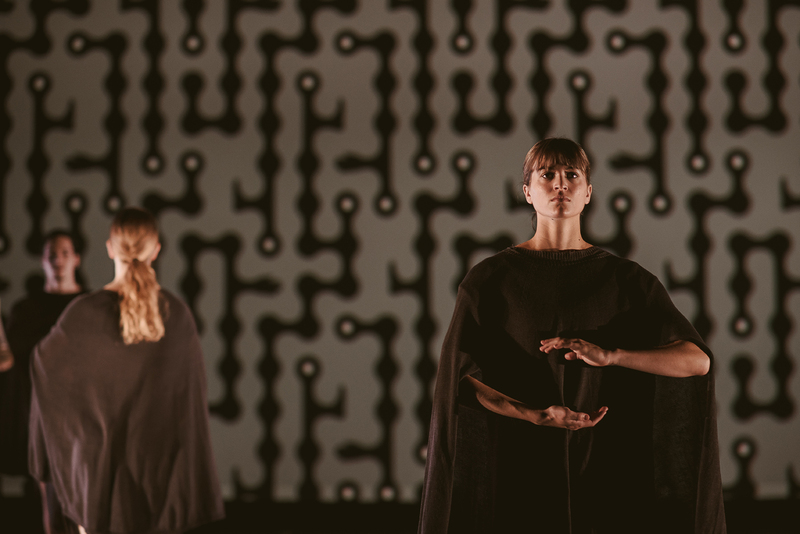 The costumes are a collaboration between Killeen-Chance and the AUT Design and Textile faculty, and are described as integral to the performance, movement and choreography. Also monochromatic, they lend drama to sparingly-used arm extension, but tend to obscure movement through the torso – perhaps a deliberate choice. Elliptical Fictions’ electronic soundscape by Emi Pogoni evolves similarly to the other elements of the work, creating a sense of timelessness and abstraction. Killeen-Chance’s choreography demands focus of dancers and observers, and as such will have niche audience appeal. A snail watches dust particles in sunlight provides marked contrast, and perhaps therefor holistic balance, in tone, intention and production technology. The O’Hara/Sanders work opens with the space stripped-back, wings removed, fluorescents on full, and the dancers dragging tarquets (panels of specialist dance floor) into place. The concept is tangible; the transitory lives of dance artists travelling for work, moving for a living. The dancers appear connected with this piece, and empowered through performing it. The movement vocabulary is large and rhythmic, with sizeable sections of contact improvisation. The work loses some momentum here; this method of movement is more engaging for those inside it. The soundtrack created by folk singer-songwriter Nadia Reid provides a refreshing change; her acoustic guitar sounds tangibly close. Flowing, earthy costumes from Kowtow’s new season support movements that are loose and free. A snail watches dust particles in sunlight crescendos with increasingly vigorous, expansive choreography, fading lights, dancers shedding articles of clothing until they undulate, naked, unbound, joyous in near-darkness. Despite significant and deliberate contrasts, both works shared some sweet moments of incidental sound. The first the squeak of rubber sneakers on tarquets and the second several large fans operated by the dancers as the work gained momentum. 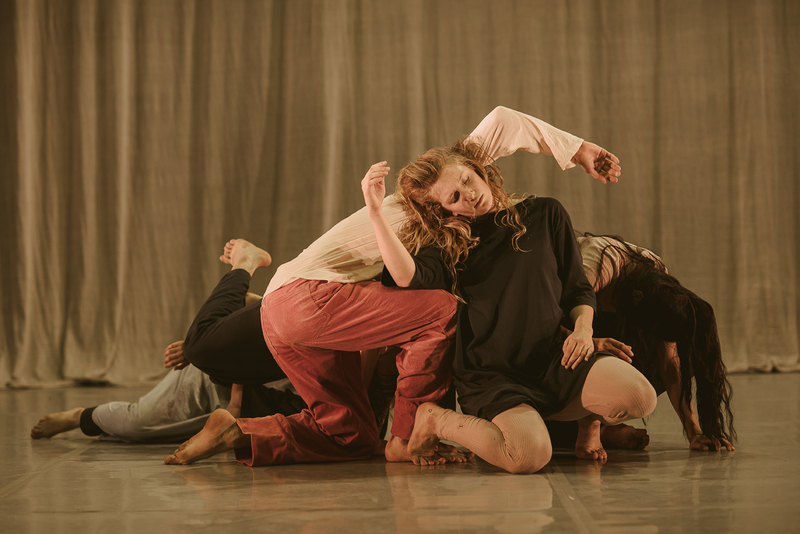 The pieces also shared elements of dance nostalgia, reminiscent of the 1970s as modern dance experimented with provocations, content and vocabularies. Note: The opening night performance of Balancing Point ran thirty minutes longer than the advertised finishing time. Original generation time 1.5254 seconds.